I drove into the village of Pola de Laviana in northern Spain one Spring day eight years ago and stopped when I saw a small engine framed in the entrance gate of a high stone wall. Believing that you take engine photographs when the opportunity presents, I crossed the road and took several. When I went over to examine the locomotive I was amazed to find that the valve stems came out of the front of the valve chests. I did my best that trip to find some identifying marks on this 650mm gauge engine, which was owned by Cementos Fradera SA, their No.3. [*] One evening, after I had ridden to Rioseco on the passenger train behind it, with the assistance of the crew I went over all the motion looking for the usual numbers that-one finds on continental engines, but I found none. When I got home I remembered that the American Railway & Locomotive Historical Society's Bulletins for 1953 had a series of articles by the late Fred Jukes on valve gears. In the November 1953 Bulletin No.89, I found a similar valve gear attributed to the Chief Engineer of the Swiss Locomotive Works, Mr Brown. 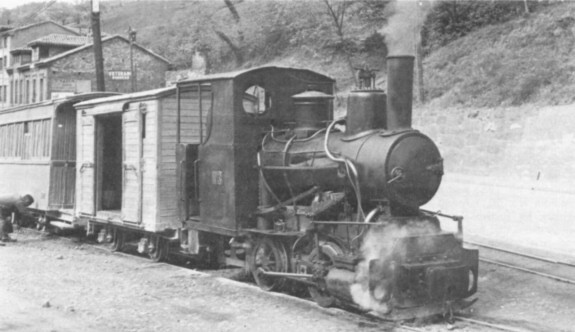 This was not enough to identify the engine as built by SLM for some of Brown's innovations had been used by other builders. No one had any factual data on the builder of this interesting industrial engine. Several years later I consulted Herr Helmuth Hinze who in Hamburg maintains what he calls "Welt Datenbank". While he agreed with me that SLM was the most likely builder, he had no factual data to support the conclusion. So the matter rested. Cementos Fradera No.3 was an orphan of unknown parentage. Early in 1973 Herr Hinze unearthed a drawing of an SLM 75cm gauge 0‑4‑0 tank engine which had the identical valve gear, identical tea caddy type dome and exterior throttle valve. The drawing showed no cab and a crosshead driven feed pump. There was now no doubt that No.3 and the engine on the drawing were mechanically the same and that No.3 was an SLM product. These we have reason to believe were built for stock and sold over the period from 1875 to 1882. The 650mm gauge is peculiar to the Spanish industrial lines in the Rio Nalon valley and immediately works number 85 strikes you for all of the others were to more or less common gauges. No.3 was cut up along with one Linke Hoffman and two Decauville locos when the line was scrapped sometime in late 1968 or early 1969. 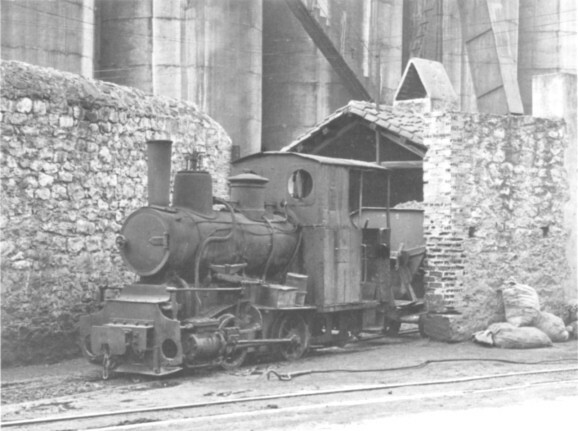 It is unfortunate that none of the faithful was around at the time for this was a unique engine worthy of preservation. It probably ended its days as scrap for the steel mill at Duro Felguera. I, for one, feel better now that we know it was built by SLM and a reasonably educated guess says it was their 85th engine built in 1875. * A full account of the system at Cementos Fradera can be found in my book "Rails to the Setting Sun": Also included is a drawing of the unusual valve gear of No.3. Brief details also appear in the Society's Pocket Book SP.